Israeli man from Jerusalem among victims of Brussels airport attack. 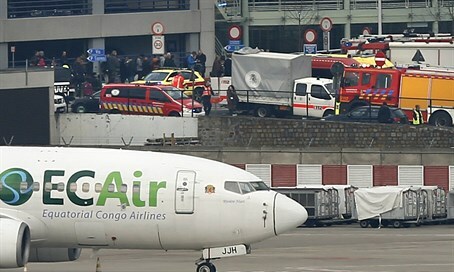 The Foreign Ministry confirmed on Tuesday that an Israeli man from Jerusalem was wounded in a suicide bombing at an international airport in Brussels, Belgium. He is in light condition and suffers from a foot wound. The victim received emergency medical treatment on site and did not require transportation to a nearby hospital. At least 17 people were killed and 40 others were wounded when two explosions went off inside an international airport in Brussels. Another blast later went off at a metro station near the European Union's buildings in Brussels. Reports indicate that four blasts went off at various metro stations in the city. While the circumstances surrounding the event have yet to be revealed, Israel's Foreign Ministry continues to be in touch with local authorities in an attempt to determine whether there are additional Israeli victims.